With a fascinating history, South Africa’s political history has long held the world’s attention. Since a long time back in history, Cape Town has been a place of great political significance. 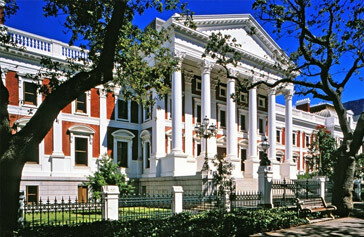 If Pretoria is the administrative capital of South Africa, Cape Town is its legislative capital. As just, the “home” of the South African Politics, the Parliament Buildings are found at the top of Adderly Street, just adjacent to the Company Garden. The Parliament Buildings lie in the uppermost corner of Company Garden, with their entrance on Parliament Street. As such, it is not unusual for locals and visitors alike to encounter Members of the Parliament in coffee shops or restaurants in the surrounding areas. Interestingly, journalists use this area to hunt for news. The Parliament Building itself, which also houses the Library of Parliament is beautiful with its central dome and Corinthian porticos and pavilions. The original designer, Charles Freeman, miscalculated the foundations and was replaced by Henry Greaves, who oversaw the building until completion in 1885. The new House of Assembly was designed by Sir Herbert Baker. It is possible to visit these flawlessly manicured gardens and well maintained buildings which are so rich in history. The tours, which are free, include a video presentation and a guided walk exploring the history, the functions and workings of the Parliament. The tours are offered from Monday to Friday between 09h00 and 12h00, excluding public holidays and last about an hour. Tours should be reserved a week in advance, but even if you are on a tight time schedule, you can still try your luck for a short-notice slot. Once your reservation is secured, be sure to arrive 15 minutes before the scheduled start to sort out all the formalities. You should also bring your passport along as identification. The tours begin at 100 Plein Street and you are advised to leave all bulky bags at your hotel. It is from here that the President gives his State of the Nation Address, after the opening of Parliament, which involves several road closures and demarcated ‘no parking zones’ around the Gardens - a challenge for locals getting in and out of the Cape Town city centre, but a welcome spectacle for visitors. Visitors can buy tickets to sit in the public gallery during parliamentary sessions between January and June, although you need to remember to have your passport with you, and there are guided tours though the Houses of Parliament buildings during the week.